Geelong’s green spine in the CBD shows what is possible for Goulburn. Goulburn, how would you like this green streetscape (above) to be your new main street? A few years ago Geelong embarked on a revitalisation of its CBD. This was a key outcome: a green spine running along the south edge of Malop Street. 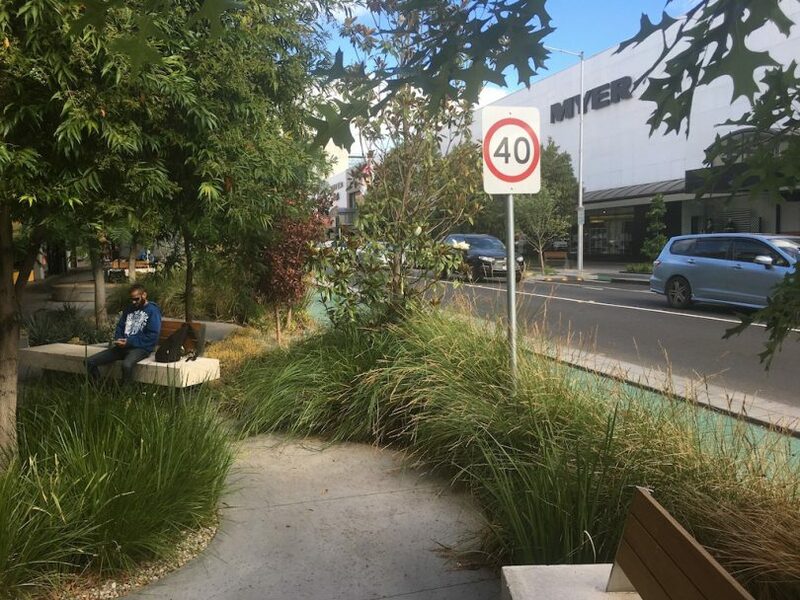 One lane of car parking (I can hear the screams from Goulburnites as a write) was replaced by an 8-metre wide ‘Botanic Walk’ in Geelong to create a ‘city in park’ experience. The aim was to create a place where people can relax, meet friends, shop, eat, walk and play. Pedestrians, not cars, are a priority. Like Goulburn, wool-generated wealth and gold discoveries contributed significantly to early Geelong, and happily for the Victorian city, many of the massive wool warehouses have not been pulled down. Viable businesses operate from within them. The Victorian Government contributed $8 million to the Malop Street enhancement. Unfortunately for Goulburn, instead of money, the NSW Roads and Maritime Services maintains a major hurdle for CBD beautification, by not handing over jurisdiction of Auburn Street to Goulburn Mulwaree Council. Mayor Bob Kirk and general manager Warwick Bennett will soon meet RMS southern region manager Sam Knight in yet another attempt to get control of the main street. This has dragged on for too long. Maybe a new Member for Goulburn after the next State election will bring RMS into line and allow a community to take ownership of its main street? Not for a moment am I suggesting Goulburn adopt all aspects of Geelong’s upgrade. But the shady greenery, seating, and traffic-calming are elements that would turn Goulburn’s main thoroughfare into a people-friendly precinct. A fresh round of consultation has opened for the Goulburn CBD masterplan, and I for one support the proposal to close Market Street (although access should be allowed from Sloane Street for a shared zone – for cars restricted to 10 k/ph, pedestrians and cyclists). I support a 40 kmph speed in Auburn Street, and removing the concrete median strip. The consultation recommendation notes that such removal would require approval from RMS. How insulting. Something must be done urgently to update Auburn Street. For a city so close to Sydney and Canberra with new residential estates being rolled out on the fringes, the shopping centre should be booming, rather than marking time, as it does, by the number of businesses closing their doors. Online shopping is partly to blame, but it is also evident people are choosing to shop elsewhere. Deputy Mayor Peter Walker and his wife Cath settled down to enjoy breakfast on the footpath outside the Tattersalls Hotel one recent morning, only to have their peaceful moment spoiled by a b-double fuel tanker trying to negotiate the tight turn from Clinton Street into Auburn Street. You can’t blame the driver, he was probably following his GPS. The trucks and other highway traffic should be diverted down Sloane and Grafton Streets. In time, Clinton Street can be reduced to single lanes and made pedestrian-friendly to encourage residents moving into the CBD to move about without worrying about cars. Like many cities, Goulburn is car-centric. It’s an easy lifestyle but needs to embrace walking, rather than protecting car parks directly in front of shops. Such a culture is keeping Auburn Street as a car park, and not a pleasant meeting place and consequently, a vibrant shopping strip. If you’re a Goulburn resident, what are your thoughts on this issue? Share them with us by commenting below.